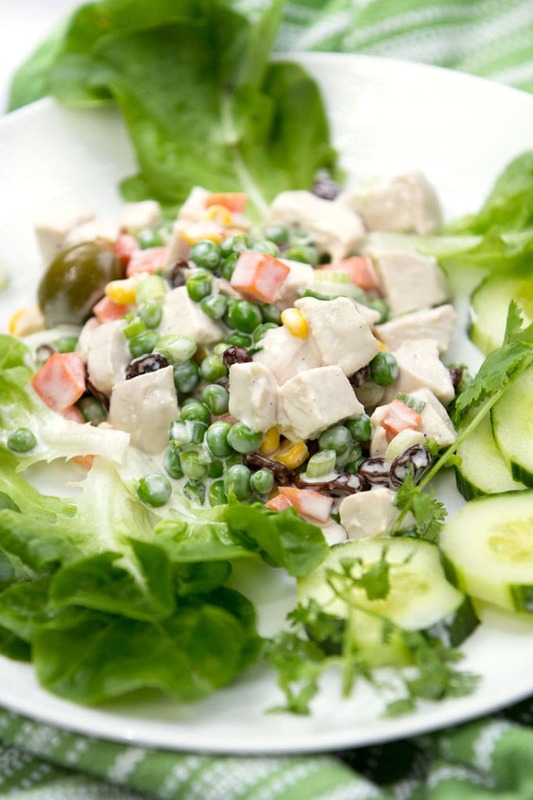 Brazilian Chicken Salad: Salpicão gets its exciting flavors from the delicious creamy lime dressing tossed with chicken, olives, raisins, green onions, carrots, peas and corn. It’s a great dish for brunch, parties and picnics. The recipe is easy and you can do all the prep work ahead. So when I tell you that this recipe feeds five, take that with a grain of salt. If you have big enthusiastic eaters in your family, as I do, you might want to double this recipe. It’s easy and everything can be prepped ahead. Whisk the dressing ingredients: mayo, lime juice, honey, salt and pepper. Set aside. Poach the chicken and cube or shred it. Chop and blanch the carrots for three minutes. Chop the scallions. 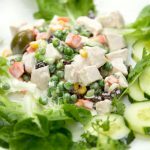 Mix chicken, carrots, peas, corn, olives, raisins, scallions and dressing. Serve on a big platter surrounded by lettuce and cucumbers. Or pile it into sandwiches. Or make Brazilian chicken salad roll-ups in soft tortillas and pack them into your cooler for a summer picnic…. Salpicão is a very popular dish in Brazil. I’ve never been to Brazil but I first tasted Salpicão at an ethnic grocery in my neighborhood and loved it immediately. 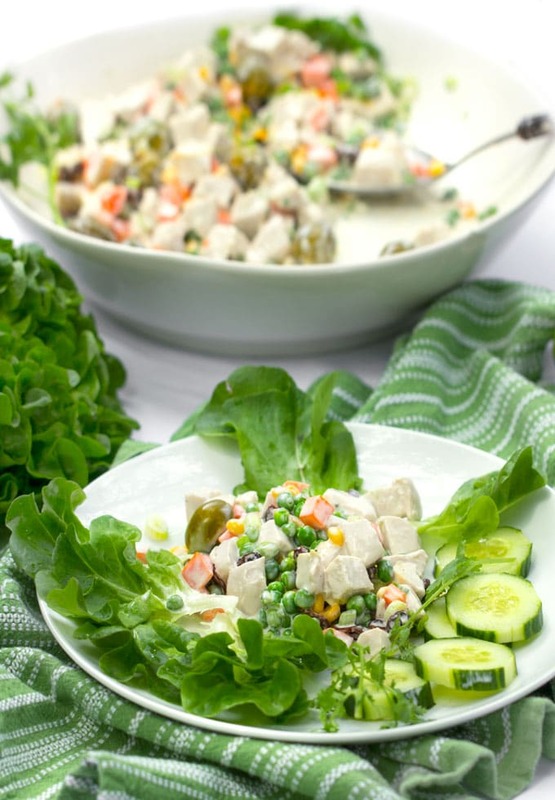 It’s got so much to love – tender chicken, lots of veggies, the exciting contrast of sweet raisins against salty olives, all in a creamy lime dressing. Let me say up front that (as with all the recipes on Panning The Globe) this is my recipe, an adaptation of Brazilian salpicão. It’s fairly close to authentic salpicão except for a few changes. Authentic salpicão is made with shredded chicken, not cubed, and it’s traditionally served with crunchy potato sticks tossed in and sprinkled on top. I can easily imagine how delicious crunchy salty potato sticks would be in this dish and I definitely plan to try it that way soon! I encourage you to do the same if you want to sample Brazilian chicken salad in its truest form. In Brazil you will find salpicão at parties, weddings and all sorts of special occasions. It’s a great dish to serve when company is coming because you can get everything ready ahead of time and make a huge bowl of it. It looks as exciting as it tastes. 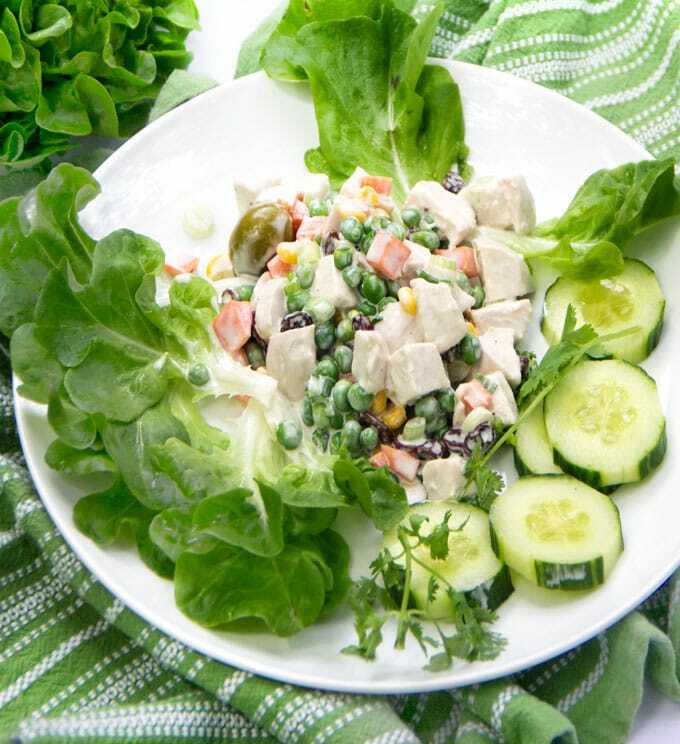 Here’s the recipe for Brazilian chicken salad: salpicão. If you try this please come back to let me know what you think! 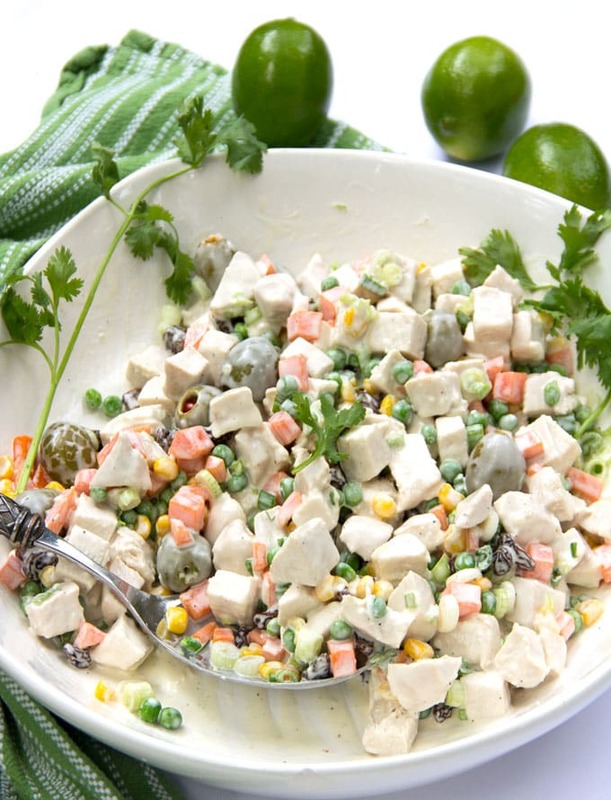 Brazil’s famously delicious chicken salad is festive and perfect for summer parties and picnics. It’s an easy recipe and you can do all the prep work ahead. Double or triple it if you’re expecting a crowd. 1/2 cup plus 2 tablespoons of mayonnaise (I recommend Hellman’s) or use vegenaise for a tasty mayo low in saturated fat. Make The Dressing: Whisk all the ingredients. Cover and keep in the fridge while you make the rest of the salad. Can be made up to a day ahead. Store, covered, in the fridge. 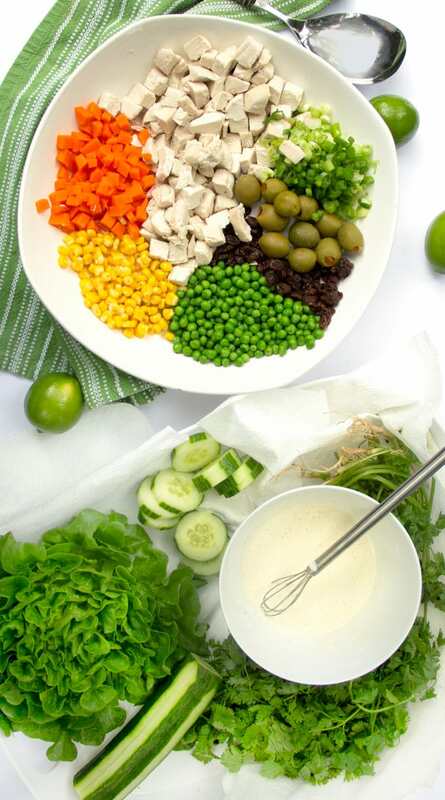 Assemble the Salad: In a large bowl combine all the salad ingredients: chicken, peas, corn, carrots, raisins, olives, and green onions. Pour dressing in (you may not need all of it) and toss. Taste and correct the seasoning with additional salt and pepper, if you like. Serve cold or at room temperature. Ahead of Time Prep: You can chop and blanch all the veggies and combine them in a bowl with the chicken, up to a day ahead. Store, covered tightly in the fridge. Toss with dressing before serving. Yay! I’m glad to hear it. What a gorgeous salad for summer!